I encountered a problem doing functional data testing for Maintenance Plan an Item upload. 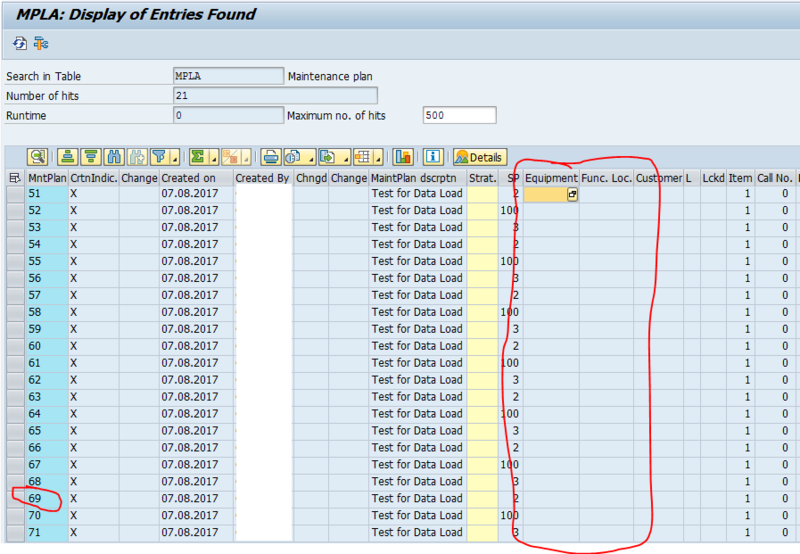 When I go to SE16n to check if the entries were uploaded properly using an LSMW program, the Equipment Number (EQUNR) and Functional Location Number (TPLNR) don't show up in the table. However, when I open these Maintenance Plans individually (using IP03), I can see that the appropriate EQUNRs and TPLNRs are there - the fields are filled in. I assume this is some kind of an SAP bug, but I could not have found the appropriate SAP Note. It is possible, though, that I was not using the most efficient way to search for it, but I never had to raise nor use a SAP note and am not sure how to effectively find it. Do you know how can I resolve this issue? I would be grateful for your advice. Do you find equipment number and location/account assignment populated in MPOS table. Use the maintenance plans you have in MPLA table for this check? I think the technical objects assigned on maintenance plans indirectly create a maintenance item and technical object info is usually used from MPOS table. Table MPOS is for Maintenance item. Technical Objects will be available in MPOS only. The technical obejects are assigned to the maintenance items (not header).